90th Birthday Centerpieces - 11 Lovely Table Decorations! A well-chosen 90th birthday centerpiece adds color and style to the celebration. Here's how you can make sure that your centerpieces make a fabulous impression! How sweet are these burlap flower centerpieces? Perfect for an outdoor celebration or a casual party. There aren't any instructions, but I think you could replicate this pretty easily with some pre-made burlap flowers, burlap ribbon and colorful thin ribbon. Quickly add color and vibrance to the tables with this easy-to-use 90th birthday centerpiece. 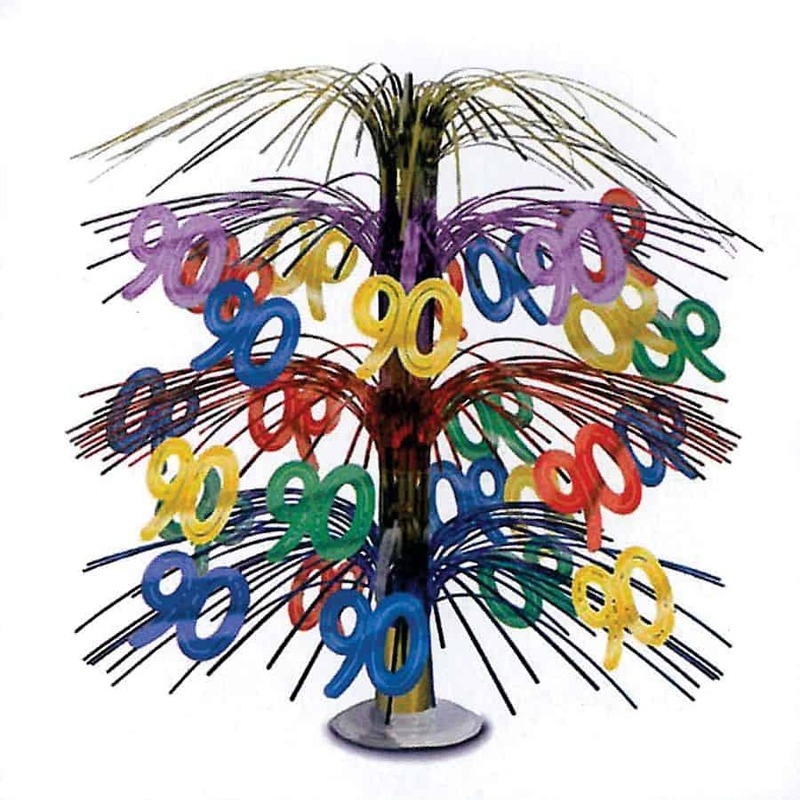 The 18″ centerpieces fan out to add color and dimension to any table setting. Pair them with a solid color tablecloth and place settings in any matching color to create a festive look for your party. 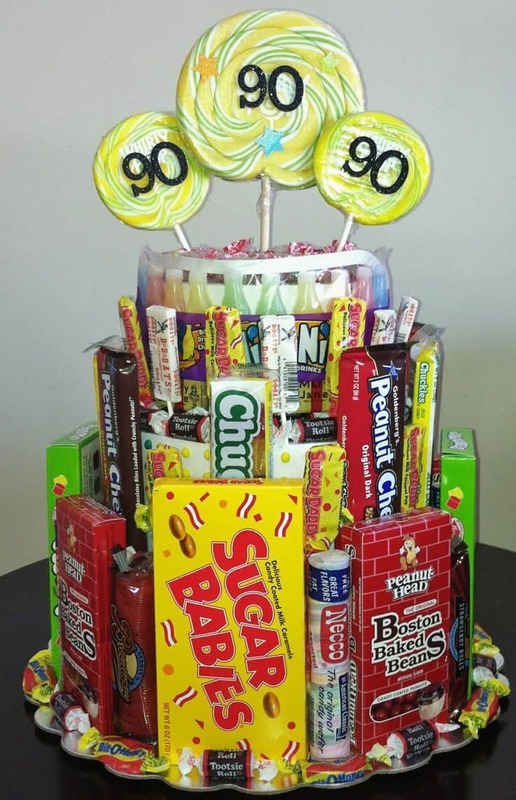 This bright and cheerful centerpiece features candy from the 20s and 30s – a nostalgic and fun look for the party! Yet another simple DIY stable centerpiece that can be customized to fit your party colors! 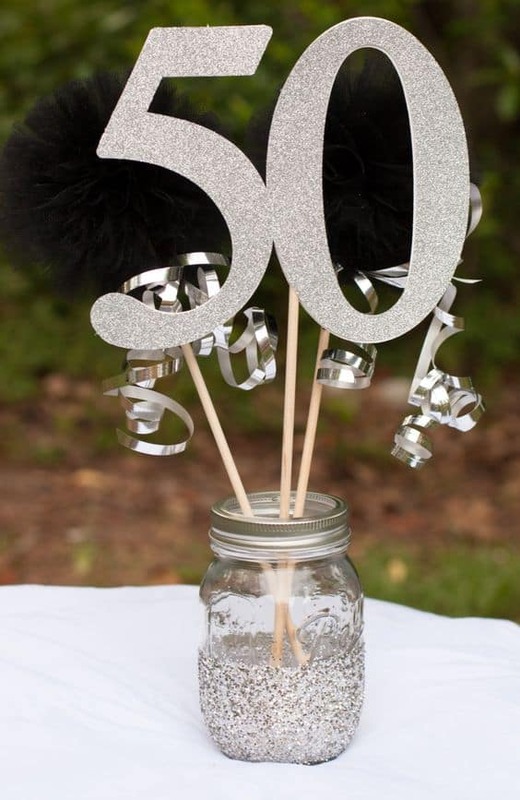 Just add numbers to sticks or straws (check your local craft store for wooden or cardboard numbers), add dried baby’s breath (or your choice of flowers) and tie a ribbon around a mason jar…so easy yet so cute! Add a touch of sparkle to your tables with these easy-to-﻿make﻿ glittery centerpieces! What a delightful way to showcase old photos - and add a touch of humor to the centerpiece! There aren't any directions, but this looks pretty strait forward. 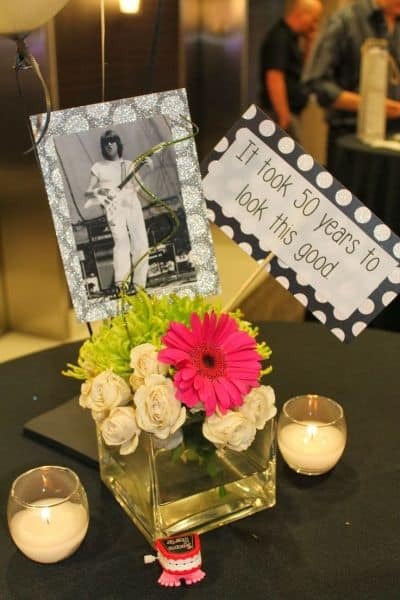 Use flowers to match your theme, and look for coordinating frames and card stock to make the "It took me 90 years to look this good" sign. Carefully chosen centerpieces add style and color to your party. Here are a few tips to choose the best table centerpieces for your 90th birthday party. You want your centerpiece to be impressive enough to be noticed, yet not so tall that guests have a difficult time seeing over it to talk to each other. Preferably table centerpieces should be under 26". Consider using tall centerpieces at the dessert or buffet table. They're also perfect for the gift table if you're having one. A 90th birthday celebration is an ideal time to reflect upon the celebrant's life. Everyone at the party will love seeing pictures from throughout the years. One of the easiest ways to use photos as centerpieces is to use inexpensive frames to display the pictures. Look for frames that are open on both sides so that you can display 2 pictures. You can also add pictures to flower picks and nestle them in the flower arrangements. It's not as common as we'd all like to celebrate a 90th birthday, so you definitely want to highlight this important number! 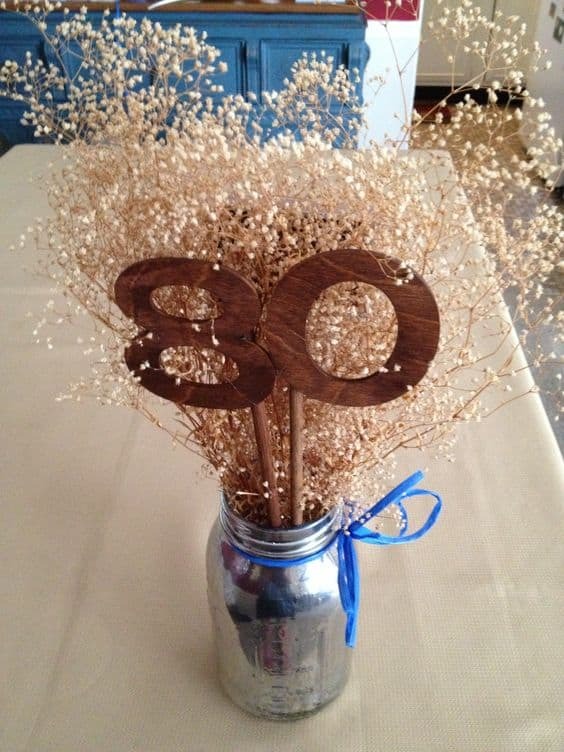 An easy way to add the number 90 to table centerpieces is to simple insert cupcake toppers into the centerpieces. You can also add decorative 90 stickers to vases or the centerpiece holders. Zazzle has a great selection of 90th birthday stickers in styles ranging from whimsical to elegant which would work well. 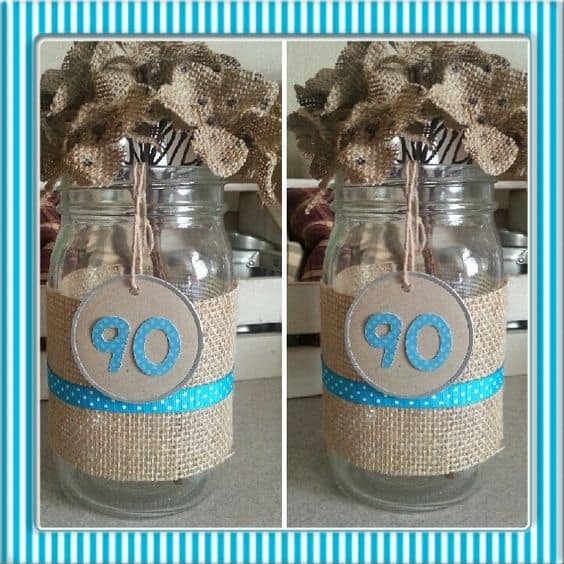 There's not actually as many pre-made centerpieces for a 90th birthday as you might think. You'll be hard pressed to find table centerpieces at your local store. The best places to check online are Amazon and Etsy.